Finally a dwarf butterfly bush that is sized for small yards and containers. The Blue Chip Butterfly Bush Buddelia is easy to grow and produces beautiful purple blue blooms from summer to frost. 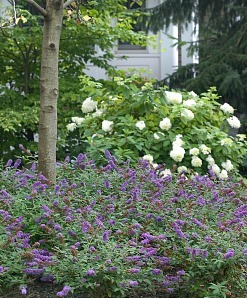 A maintenance free butterfly bush that requires no deadheading to keep on blooming. Cut back to 12 inches in early spring and let the show begin. Blue Chip Butterfly Bush Buddleia grows beautifully whether planting in the ground or in pots on the porch or patio. Dwarf Blue Chip Butterfly Bush is a hardy perennial plant that is frost tolerant and non-invasive. The Lo & Behold Blue Chip Buddleia is long blooming with blue purple fragrant flowers, drought tolerant, deer resistant, heat tolerant and easy to grow. The perfect plant for the lazy gardener and butterfly gardens. The Blue Chip butterfly bush is also an excellent hummingbird plant. Also available the Chip Trio - Blue Chip Buddleia, Pink Chip Buddleia and Lilac Chip Buddleia. Blue Chip Buddleia matures in the 2 to 3 foot height range with a spread of 24 to 30 inches wide.